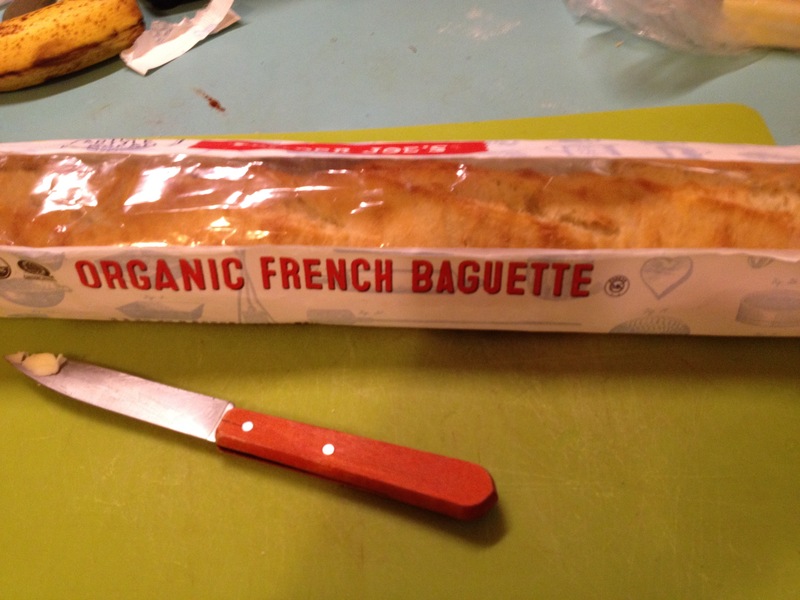 You will see this bread on many a “Trader Joe’s Top 10” and “best products” lists, and rightly so. I think its one of the best products they sell, by far the best packaged bread I’ve had, period. Its a very good, country style bread. Pretty sure this is a slow rise sourdough; its usually full of air holes. Its has a very nice chewy texture and a good crust, of course which is better heated. In fact it gets 10x better toasted or grilled. Tuscan Pane makes unbelievably good toast, and many a morning this bread toasted is what I crave at breakfast. Top the toast with butter, jam, cream cheese, cheese, veggies or just about anything and you have a little slice of toast heaven. One of my faves would be with cream cheese and tomato. Or brie with jam, warmed till the brie is a bit melty. 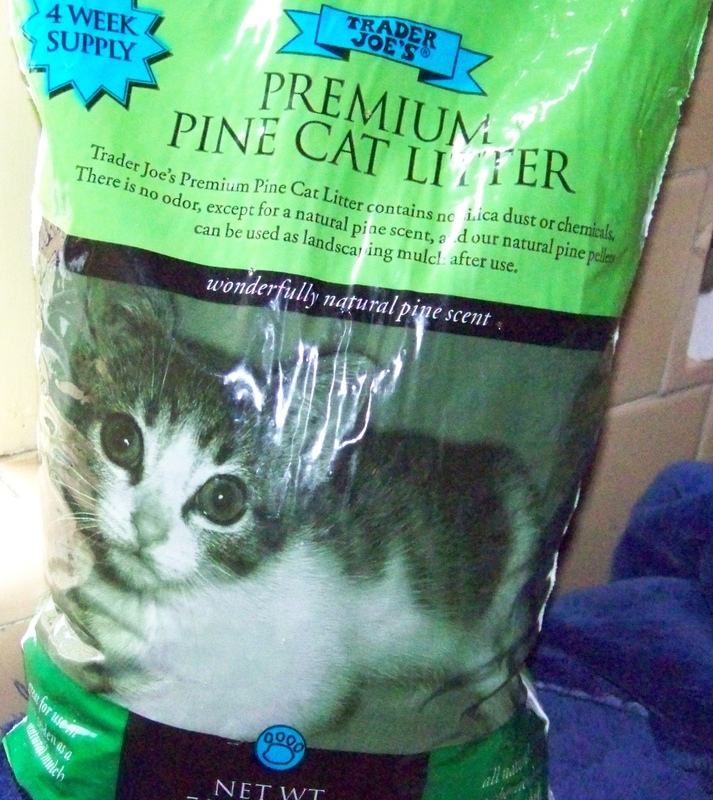 A large 27 oz. loaf of Tuscan Pane original “white” was until recently $2.29. It has gone up to $2.49 (All wheat products are up) The Whole Wheat version goes for $2.69. Flavorwise I think I prefer the original “white” one to the whole wheat one but the whole wheat is still good too if you prefer that. I usually always prefer to buy whole wheat breads, but this one, not really. 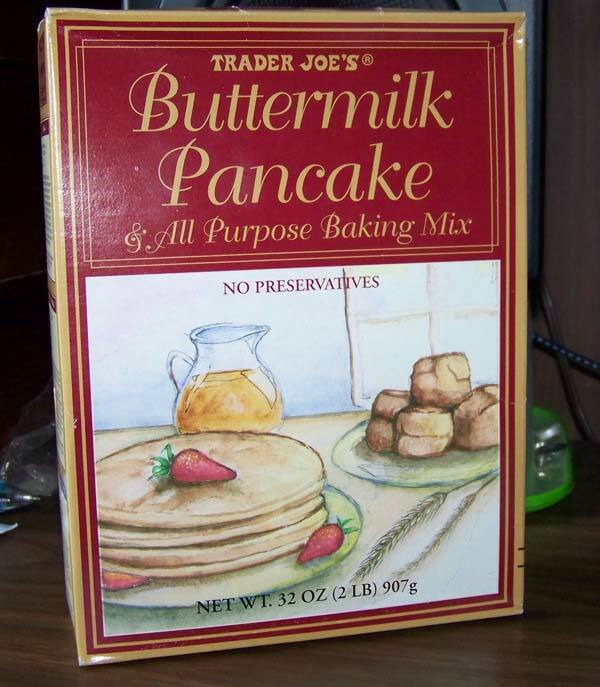 Since first trying this, this is yet another TJ product I’ve been become totally hooked on. I must have Tuscan Pane on hand at all times now. I keep it in the freezer; it keeps well frozen at least a week or two. Grill or toast a few slices of bread. When golden brown, immediately rub a cut clove of garlic on the bread. Take a slice of ripe tomato and ’smush’ it into your toast. If you want to be neat, you can dice your tomato and top it (but rubbed in is authentic Italian or Basque Pa Amb Tomaquet style) Drizzle on a nice splash of olive oil, sprinkle with some fresh black pepper and sea salt. A little herbage (basil) on top can’t hurt, but if you don’t have, thats fine. If you want something heartier, add some sliced or grated parmesan or other cheese or perhaps some prosciutto. Done. YUM! I live in England. I love your blog we don’t have TJ’s here and it’s so different from a Tesco’s or Sainsbury’s. 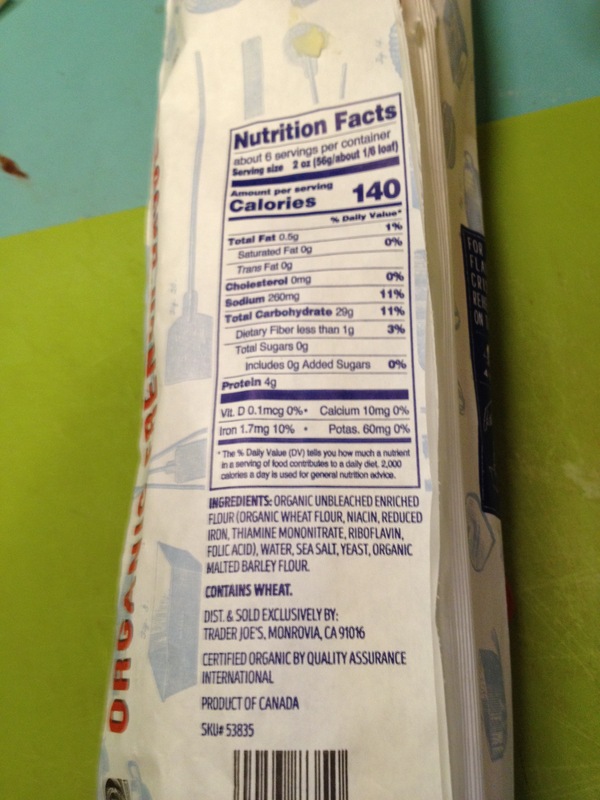 I was wondering about Trader Joes bread overall. 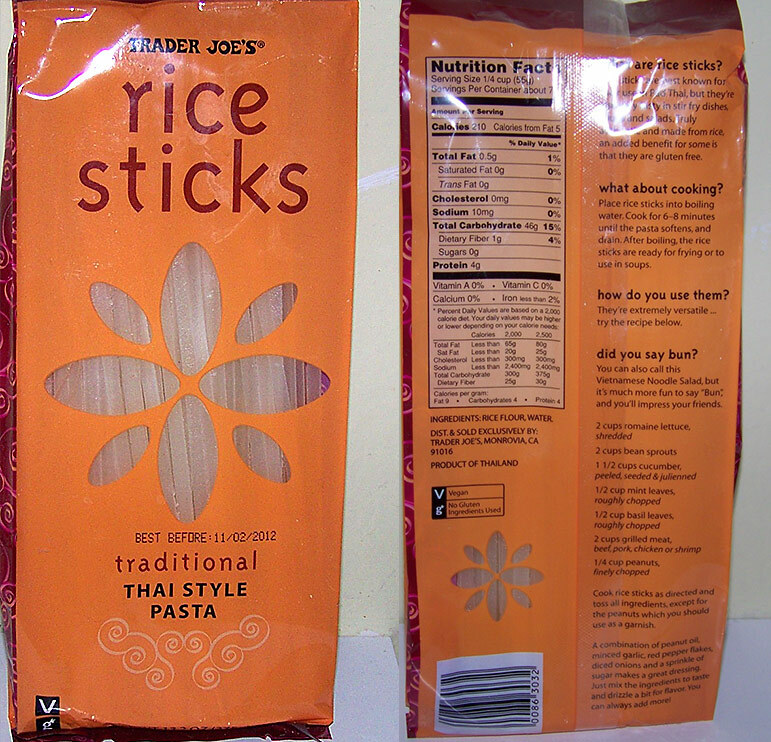 I’m a student in Packaging Design and cannot find out what Trader Joes bread looks like online. And I can’t afford a trip to NY! If you find yourself in the bread isle on your next visit could you write about it? Hi Kate; I think you’ve found the info you want right here., a picture and description. Trader Joe’s is interesting design-wise, in that they have artists in each store who hand paint all the signs (!) I’m sure if you Google around you will find some examples. Trackback: Insta-Party: Lemon Drops and Mini Tuna Melts | Ready, Set, Party! TJ has changed bakery and I have lost the love I had for this bread. Are all the stores the same because in the Raleigh NC area the bread has changed. Oh really? Doesn’t seem the same as it used to? what happened to the texture of the bread? It’s more dense rather than the lighter bread with “swiss cheese” holes in it. I don’t like it dense. Won’t buy it again. I love the bread but hate the large hole on the inside of every loaf that prevents this bead from being used for sandwiches or anything else! We’ve been buying this bread (white) for years, but this past week’s version tastes too salty. My husband and I both discovered this, independently. What gives? 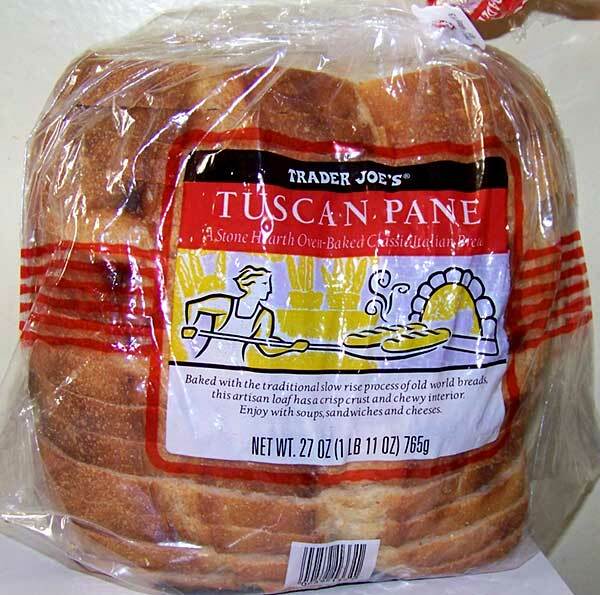 What happened to TJ’s Tuscan Pane bread? Just bought a loaf yesterday, very dense, no chewy texture or holes. Reminds me of Wonder bread, yuck! Purchased in Danbury CT. I just discovered this today at TJ’s in Cincinnati and it’s outstanding—exactly what I want to see in the bread basket at any “better” Italian restaurant. Crusty exterior, chewy interior… perfect! Can’t wait to toast it and smother it with garlic, or dip it in some high quality olive oil. It’s wonderful with olive oil! The bread really comes alive from toasting. I also make great bruschetta using it, toast on one side, rub garlic, rub tomato, olive oil…. Yum! HAD ONE SLICE AND MY MOUTH WAS BURNING FOR 12 HOURS! I HAVE BEEN BUYING THIS BREAD FOR YEARS, ALWAYS MY FAVORITE UNTIL MY LAST PURCHASE ON 8-24-18 AT THE TJ”S NEAR PORT JEFF NY. White bread has definitely changed. No holes – no taste. Do not like this bread any more. Go back to old one! Hit or miss on Tuscan Pane. Sometimes no holes, no taste, no crust and at other times the original crusty version. Last week’s purchase was the tasteless variety. Did they switch bakeries? Danbury CT store. Dunno. Lately I’ve been buying the Sourdough version they have. Give that one a Try.